Lowdown: Quantum physics for the uninitiated. There is a holy grail for popular science books. That holy grail is a book that would manage to convey the intricacies of quantum physics at a level that practically anyone can understand, or at least everyone with decent high school education. I'm talking about a book that would achieve for quantum mechanics what The Selfish Gene has achieved for evolutionary biology, a book that would not only explain how the science works but would also demonstrate how it applies to life as we know it. 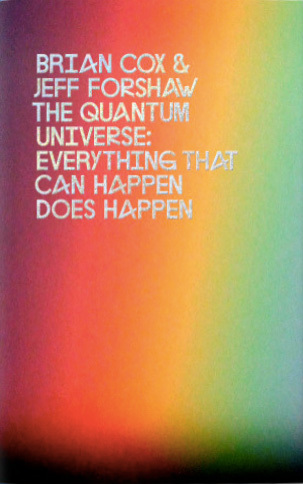 I had reason to believe The Quantum Universe may be the book that does it. That reason is Brian Cox, the physicist from Manchester who is running experiments at CERN's Large Hadron Collider. The guy who brought The Wonders of the Solar System and The Wonders of the Universe to our TVs. In my opinion, the guy who is best placed to replace the likes of Carl Sagan and Richard Dawkins as the public's face for [popular] science. With apologies to Jeff Forshaw, about whom I know nothing, my question was whether Brian Cox can bring the magic touch to quantum physics and explain them at a level that even I would understand. I, a person who read numerous books on quantum mechanics already and who studied basic physics at university level, but was always left with a bad taste in my mouth. The Quantum Universe starts off in a very promising manner. Easy to read and often even funny, it details some of its subject's history and basics. The problems start at a relatively early stage, about 20% into the book, when it starts explaining how the wave functions of quantum particles work. As of that point the book's reader needs to either have a pretty solid background in maths, start reading the book extremely carefully and often read the same page again and again, or give up and take the authors' word for it. I could feel my knight anguishing about yet another wild goose chase for his coveted grail. Not that I'm saying The Quantum Universe is a bad book. Far from it. It does explain its subject matter's inner working in a relatively accessible manner, at least when compared to other books. It is also an often exciting read, as with the part where readers are offered a magnificent explanation on how transistors work. An explanation of the type that made me sad to think that, yet again, I was wronged at both school and university with teachers that should have delivered as clear an explanation as Cox and Forshaw do but instead left me perplexed and agitated. Even without fully taking the authors' explanations in, basic reading of the book should let its readers understand why quantum physics is telling us in a rather unequivocal manner that there is no such thing as "nothing" in our universe. That observation has significant implications and serves as the basis for books such as Lawrence Krauss' A Universe from Nothing (a book that happens to be next on my reading list): because if there is no such thing as nothing, then we do not have to explain how our world came to be out of nothing; and if we do not have to supply such an explanation then there is yet another reason for us to stop wasting our time with man made inventions such as God, a concept that came to explain the very phenomenon quantum physics debunks. In other words, The Quantum Universe demonstrates the victory of science yet again, in the sense that even when the explanations it provides are unintuitive, these explanations really do work by virtue of them being real through withstanding scientific scrutiny. What good is an intuitive explanation if it fails the test of reality? We can definitely tell what good the real explanation is, as that real explanation supplies us with the transistor - billions of which are powering the equipment on which you're reading this. Before finishing off, I have to provide a disclaimer and say that a lot of the hardships I have faced with The Quantum Universe are the result of the stressful times I have been through while reading the book. This direct result of personal circumstances meant I was not able to concentrate on my reading as much as I would have liked to. Let's face it: quantum physics is probably not the best reading material for train rides, with all the distractions they bring to the equations. However, through all of the distractions it still has to be said that The Quantum Universe is probably the most approachable popular science book out there dealing with this particular subject matter. Overall: No holy grail, but a fine effort and a great read still. Unless you're a physicist by trade, expect to learn a lot here! 3.5 out of 5 stars. Sure. And moisture is the essence of wetness, and wetness is the essence of beauty. S Hawking is simply wrong in accepting it. Obviously wrong. Everyone who accepts the story of the Higgs particle is simply wrong. Singularity and the Big Bang MUST have happened with the smallest base universe particles, the gravitons, that MUST be both energy and mass, even if they are inert mass just one smallest fraction of a second at singularity. All mass formats evolve from gravitons that convert into energy i.e. extricate from their gravitons clusters into mass formats in motion, energy. And they all end up again as mass in a repeat singularity. Universe expansion and re-contraction proceed simultaneously..
Who Suppresses Science Creativity? Does Academia Suppress Creativity? * Higgs Particle? Dark Energy/Matter? Epigenetics? All YOK! * Earth-life is just another, self-replicating, mass format. * All mass formats evolve from gravitons, the primal universe mass-energy particles. * Since singularity gravitons are extricated from their big-bang clusters , i.e. become mobile, energy, at a constant rate. * All mass formats follow natural selection, i.e. intake of energy or their energy taken in by other mass formats. * Evolution Is The Quantum Mechanics Of Natural Selection. * Quantum mechanics are mechanisms, possible or probable or actual mechanisms of natural selection. * Life’s Evolution is the quantum mechanics of biology. * Every evolution, of all disciplines, is the quantum mechanics of the discipline’s natural selection. Inflation and expansion are per Newton. Since the Big Bang galactic clusters loose mass at constant rate. Mass, gravitons, continue escaping at constant rate from their Big Bang fragments-clusters thus becoming energy, mass in motion, thus thrusting the clusters. Constant thrust and decreasing galactic clusters weight accelerate the separation of clusters from each other. It takes a change of culture, of the mode of reactions to circumstances, to effect a change of habit. Genetics is the progeny of culture, not vice versa. This applies in ALL fields of human activities, including economy, to ALL personal and social behavioral aspects.